Myrtle Beach is the golfing paradise of the United States - more than 100 championship courses are stretched along the stunning part of the Carolina coastline, offering fantastic value and endless choice. 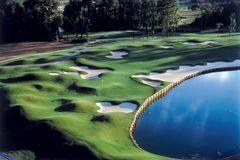 Ten of America's top 100 public courses can be found in the Myrtle Beach area, which is also renowned for the quality of service and accommodation on offer. The resort town is a famed holiday destination, featuring first class beaches and some extremely lively nightlife. Every golf tour in Myrtle Beach will be a voyage of discovery, uncovering more and more of the area's amazing golfing delights each time. To plan your perfect tour speak to our dedicated Myrtle Beach specialists.